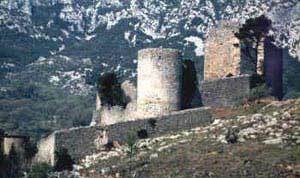 Perched over its rock piton, the castle of Baulx, dominates the village. Simple turn of guet at the XII century, protecting the baronnie from Pégairolles, the unit knows during centuries various installations. At the XIXème century it is described in ruin. Left to the abandonment, the covered monument of vegetation, partly demolished, is bequeathed to the commune in 1987. Dice at the time nait the project of safeguard, of research of files, the excavation campaigns are produced under the control of the historic buildings. It was not a question of rebuilding at one precise time, but of showing to the visitors the transformations with the liking of the periods of insecurity and of calms. To save ruins the feudal castle, emblème of a whole valley, here more than 10 years that the Association of the Companions of Tras Castel probe, listen to, look at the stones. It is this adventure which they invite you to share while showing you, thanks to photographs before and after the fabulous building site undertaken. Good visit, follow the guide. Casteland thanks association for the companions of Tras Castel which provided the Photographs and the text on the castle. Visit groups, all the year on reservations.